18 Hours in Madrid…Mostly Dining! Getting to and from Morocco from the USA wasn’t that easy. We opted for an 18 hour layover in Madrid, and enjoyed an afternoon and evening of dining. Suman found a great hotel called Petit Palace just off the Plaza Major. This hotel was in a prime location and only $96. The vibe was modern, and it included everything we needed including a view of the city from our top floor room. We were not staying long enough to take advantage of the bikes or the free walking tour, but these are great amenities. We dropped our stuff and went in search of lunch as Iberia ran out of food for purchase for those in the last rows of the plane. They had some items, but not what we wanted. Anyway, we were hungry. Suman had a place in mind from TripAdvisor called Casa Gonzalez. They served lots of cheese and meats as well with breads with spreads. Since they were known for their breads with spreads, I ordered an artichoke spread. It was mostly bread with little spread. I think Suman’s choice of a charcuterie plate was a much better option. It was good, but I wished for more tapas varieties especially after our phones took us around in circles as we hunted for the quaint restaurant. We took a much shorter and more direct walk back to the hotel as we passed through several plazas, including Plaza Mayor. The Plaza Mayor was built in 1617 during the reign of Philip III, is the central plaza of Madrid, and is surrounded by three-story residential buildings. The centerpiece of the plaza is a bronze of King Philip III. I expected it to be more crowded, but judging by all the tables outside of the restaurants, I feel like at night it would be very busy. Fernando, our guide in Morocco, suggested we check Mercado San Miguel, which was practically across the street from our hotel. 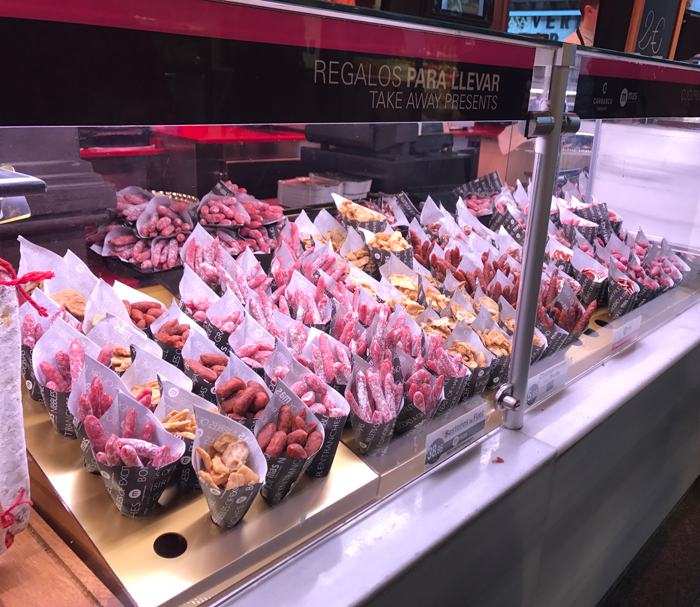 We wandered through to get an idea of what was available, and we found just about every food imaginable…meat, olives, seafood, paella, tarts, and nuts, just to name a few. It was crowded with a nice vibe. All the tables in the center were taken. It was standing room only. Not currently hungry, we just stopped at the Sangria stall. We had a choice of sangria on tap or from the bottle. Then we got to choose white or red and traditional or not. At the recommendation from the gentleman behind the counter, we sipped a glass of non-traditional red and enjoyed the complimentary olive snack for a bargain price. Wine and olives are a steal in Spain! Mercado San Miguel was so enjoyable, we decided to come back for dinner. Back at the hotel, Suman checked Facebook and saw one of her friends suggested we go to Mesón de la Guitarra, also around the corner from the hotel. The cave like atmosphere looked cool, so we decided to start there. Wine for $2 in a cup was a nice start. I got to order a potato omelet which was awesome. We also got some peppers and fried calamari. These tapas plates were quite large, so we didn’t leave any room for food from Mercado San Miguel, but we walked through once more because it was a cool, energetic place! I sort of wish we stuck with our original plan to have dinner at Mercado San Miguel, but I don’t think I would have found a better potato omelet than the one we found at Mesón de la Guitarra. WANT THIS BLOG POST IN THE FORM OF AN OFFLINE GPS GUIDED ARTICLE TO READ LATER ? For notecards and key chains visit My Shop on this website or Etsy. A portion of the sales are donated to charity and a travel story is associated with each one.